Calvary Baptist Church, Athens Texas (Pastor Kris Minefee). We hope you find what you are looking for on the site. In addition to our web site we invite you to visit a worship service, Sunday morning Bible Studies, or a variety of ministry activities during the week. We want to put you at ease. Are you looking for a way to get more connected? We are a Christ-centered church, building a healthy congregation that is committed to reaching our city, state, and world. You will find many ways to serve here at Calvary Baptist Church. On 5th Sunday we do not have an Evening Service. Pastor Kris Minefee and his wife LeeOra were both raised in Arizona and were high school sweethearts. They were married one year after they graduated from High School and attended Independent Baptist College in Dallas. 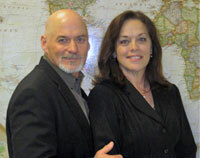 They have served the Lord as pastor and wife in both Texas and as missionaries in Arizona. They have 4 children and 5 grandchildren. Bro. Kris has over 35 years experience as a pastor and missionary and has also served as a Bible College Chancellor and theology professor in Dallas, TX. The Minefees last worked as church planters in Flagstaff, Arizona before returning to Texas where they have spent most of their lives serving in three churches from 1979 to 2008. They are looking forward to all that God has in store for Calvary Baptist truly believing that great things await us as we wait on God.us and see what we're all about. If you have a prayer request or would like to get in touch, click here.